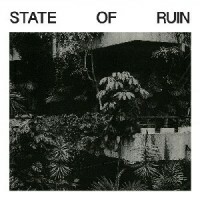 Silk Road Assassins, a trio consisting of Tom E Vercetti, Chemist and Lovedr0id, return to Planet Mu with their debut full-length "State Of Ruin" two years after their first EP "Reflection Spaces". The trio recorded over two years, working together to start with, then across different studios and via the internet when their lives became more separated. They also finessed the album at Abbey Road studios, making use of some short time to add in extra layers. The three producers day jobs are in production music, music designed and created specifically for film and games, and this album uses these skills to explore the musical forms that they love. The album explores how trap and grime's minimalist form can be built and curved into musical architecture: elegant, opaque and layered, turning the sound into lush, melodic world-building. The work gone into the album is revealed on repeated listens, every sound on this record feels built to sit within its delicate ecosystem. The fundamentals of the music are given their own sense of purpose: hand claps spray, bells tumble, guitars splinter and lush melodies waft over and fill the track's spaces like light, glinting across snapping, crisp rhythms and deep bass tones. The album also features two Planet Mu alumini, Kuedo who features on "Split Matter" brings some of his bitter-sweet shimmering melodies and on "Shadow Realm" Russian producers WWWINGS give the music a violent metallic edge, providing the record with an epic and unexpected twist towards the end. Silk Road Assassins music is built to last, and a pleasure to indulge in.